After the inclement weather in January, it seems fitting to feature the 'Ice plant' this month. 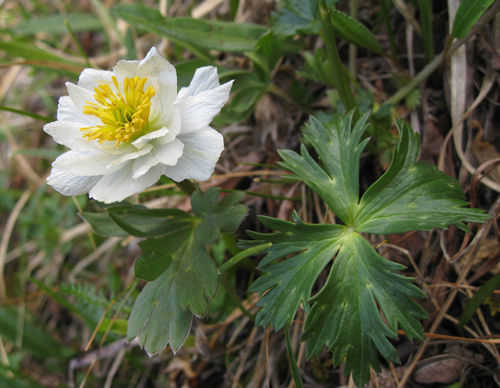 This was described by Charles Howard Bury in his 1913 diary " Wherever the snow had melted there grew a double anemone, with a bright yellow centre, whose petals varied in colour from white to the bluey green of ice in a deep crevasse". 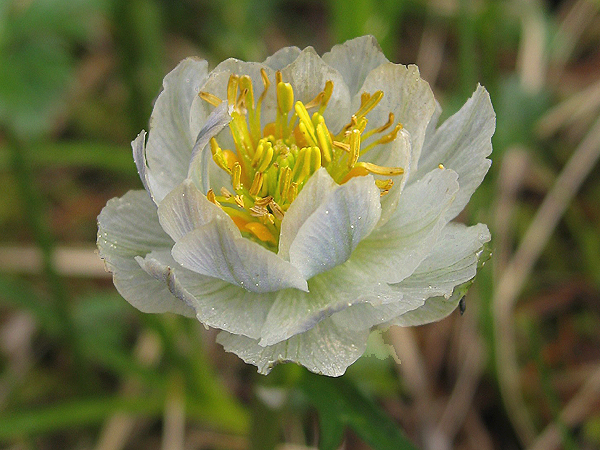 However it is a Trollius, (formerly Hegemone), which grows in the central Asian mountains, from the Tien Shan to the Altai. We met it at around 7500 ft in the Tien Shan, growing, as you would expect from ranunculacea, on a damp slope, near the Chimbulak ski station south of Almaty. As to cultivation, that seems to be difficult. One account says that whereas the plant has one or two flowers in the wild, it can have up to 12 in St Petersburg. However nearer to home, a discussion thread in the Scottish Rock Forum reveals these expert gardeners having little success. If it can be flowered successfully it would be well worth the trouble.